In the middle of all of these rainbow swimming capped swimmers is a nauseous girl in yellow who seems to be going the wrong way with the wrong stroke. That's me. 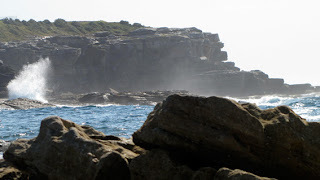 The Malabar to Little Bay swim is 2.7km long. Which doesn't seem that long now that I've swum it already. 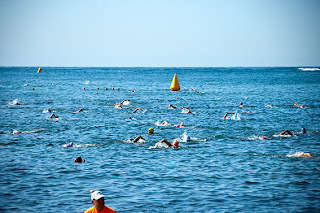 Wonderful boutique swim with excellent organisation and smaller numbers of participants. This means no getting swum over, into, around, on top of etc. It does however mean I fall off the back of my starting wave before the first buoy, but for the first time it takes the next wave until the 3rd buoy to overtake me. Yay! It's at the 3rd wave when the seasickness strikes, despite anti-nausea tablets and a relatively calm day. Debilitating stuff. Cough, splutter, breaststroke, keep on swimming, cough and splutter again. Finally make it to the end and am made to go around the final buoy before heading to the finish line. Get my own back by pushing against buoy to minimise detour necessitated by it. Am totally disorientated by the end. Am last in my age category, and in the bottom 20. Couldn't care less. I made a distance that once had me quaking in my boots whilst horribly nauseous. That alone is an achievement I wouldn't have once contemplated. Have however decided against a 5km attempt. For this year at least. One step foward, two steps back.